Adi Bari is an old house. In fact, Adi Bari means ‘old house.’ As such, it holds and tells old stories. 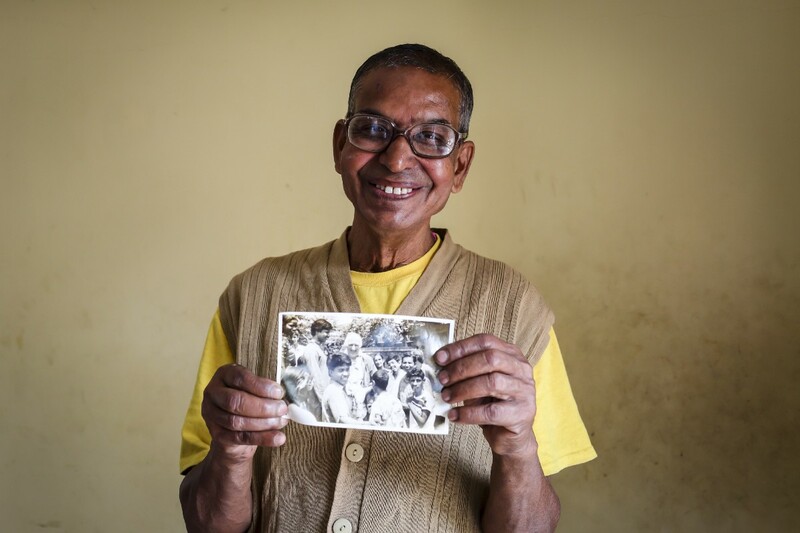 Stories like the time Madhu, a core member, received communion from Pope John Paul II, or the story of how when Patna arrived in the Community in 1984 the only thing he said was ‘Patna’, the name of a city in India, which is how he came to be named Patna. In Thakur Bari they tell stories, too. Mantu tells about visiting the L’Arche Community in Trosly, France and how, no, being on an aeroplane did not scare him. Tridib, a live-in assistant, talks about the time he scolded his arm and Neelchand, a core member, bathed it for him every night until it healed. Stories are our lifelines. They run through us, helping us to make sense of who we are and where we’ve come from. 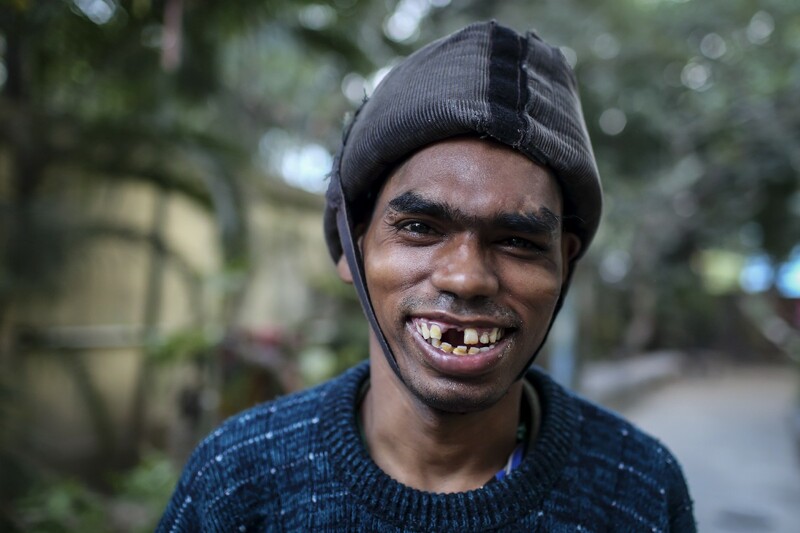 In L’Arche Kolkata there are stories told about the past, the way back past, like the story of how Ganga, an orphan who was found on the street, used to live in the Missionaries of Charity home until he was fifteen, after which he came to live in L’Arche. There’s the story about Kashi, the founding core member of the Community who joined in 1973 when he was fourteen, who would run away in those early days and then, one day, stopped running away. Kashi, the founding core member of L’Arche Kolkata. Photo credit: L’Arche / GMB Akash. Most of these stories are told while we’re drinking milky, sugary tea together. Each morning and afternoon, the Community takes a tea break from workshop activities and sits under the shade of the trees in the garden. I like that everybody knows who does and doesn’t take sugar in their tea, and that people know that ‘didi’ Hazel (from L’Arche London), who sometimes visits, doesn’t take tea at all, just hot water. It feels special, sacred almost, that people are known individually and that even if one person forgets, somebody else will remember and honour a person’s story, or choice. It is over tea that I learn that Ram, who lives across the road from the Community, has been coming to the workshop every day for the last twenty-eight years, and has a friendship with Somen. The two men often sit with their arms around one another, Somen singing his beautiful songs about the greatness of the moon and the sun, and the greatness of each person. I like that Somen knows his greatness. It is also over tea that I learn about the importance of the orange bag that Rambabu carries with him at all times and how it contains the sunglasses that he wears when he eats really spicy food. It is over tea that I learn that Madhu is known as ‘holy man’, that he has a beautiful singing voice, goes to mass at the Sisters of Charity, and was friends with Mother Teresa. 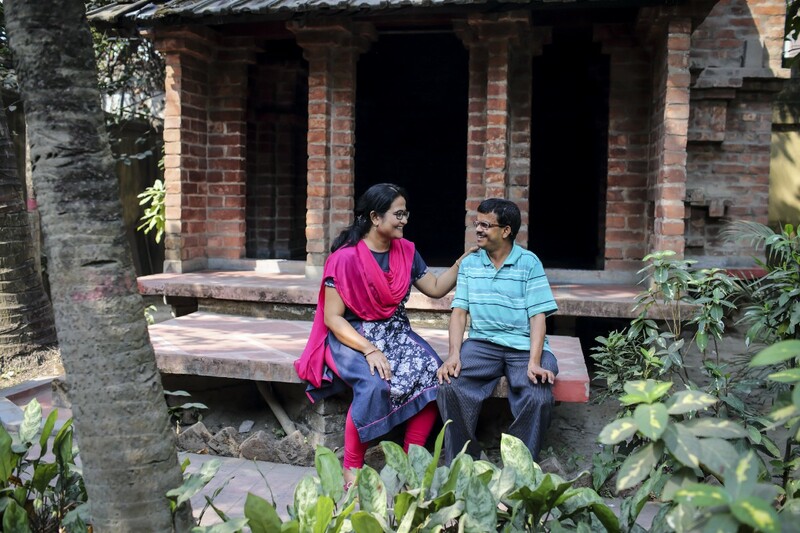 Rana, the L’Arche Kolkata Community Leader, with Krishnendu. Photo credit: L’Arche / GMB Akash. So too it is over tea that Rana, the Community Leader, tells me that in the same way that Kashi feels emotionally secure here, so too does he. I watch him as he sits and chats with Kashi, two men who have known one another since Rana arrived in the Community as an eighteen-year-old young man, some thirty years ago. I think about the depth of their friendship and the way in which they are woven so deeply and intrinsically into one another’s stories and lives. It is also over tea that I learn that Neelchand, who takes his tea without sugar, is affectionately known as ‘happy man.’ ‘Happy?’ he asks me, his voice rising with an inflection as though to be sure I know an answer is expected of me. It’s a simple and yet profound question. Initially I answer in the moment: ‘Very happy,’ but he asks it again later that same day, and during the days that follow, and it pushes me to think about the deeper examination his question invites. What brings us happiness? What do we expect about happiness and the criteria for finding it and feeling it? The kinds of questions that Neelchand asks invite us into honest, searching, conversations with ourselves as much as with the person asking the question. Neelchand had often left before I could tell him honestly ‘yes, I’m happy,’ but I carry that question with me now. Neelchand taking his place as one of my wisdom teachers alongside Teresa of Avila and Thomas Merton. As wise and as compassionate as anybody else I know, and as secure in himself, perhaps even more so. Subrata and Neelchand. Photo credit: L’Arche / GMB Akash. John Paul Lederach, a professor of peacebuilding, says that ‘to be human is to story.’I think how true that is for L’Arche: how L’Arche is about storying life alongside, and with, one another. To be human is to listen to another’s story and be moved to find the light, always some light, that leads us to compassion and love. In L’Arche we do a lot of sitting around a table, or cross-legged on a floor, telling stories. Our own and each others. We do this in part so that nobody’s story will be lost, especially if or when a person cannot tell their story independently. But we also tell stories to belong to each other, which is to say that we become known by each other. It feels important to know that Rambabu wants help to get his sunglasses out of his orange bag when his eyes start watering from those hot chillies, or that you can make Ganga laugh — and I mean really, really laugh — if you salute him. Ganga. Photo credit: L’Arche / GMB Akash. L’Arche Kolkata has been telling stories since it began in 1973. There are the founding stories, and the funny stories, and the hard and heartbreaking stories, like the story of Bapi’s death. I never met Bapi, but I know that he was afraid of cows, loved babies, and would challenge the discrimination he encountered on the street. I know these things because they are stories told and retold about him.I know that he was loved and that if you mention his name and ask somebody to talk about him, that person’s face will light up at his memory. Today, L’Arche Kolkata is home to fifteen core members who live in two houses: Adi Bari (Old House) and Thakur Bari (Prayer House). Almost all of the core members who live here were orphaned, some found on the streets or on train platforms. 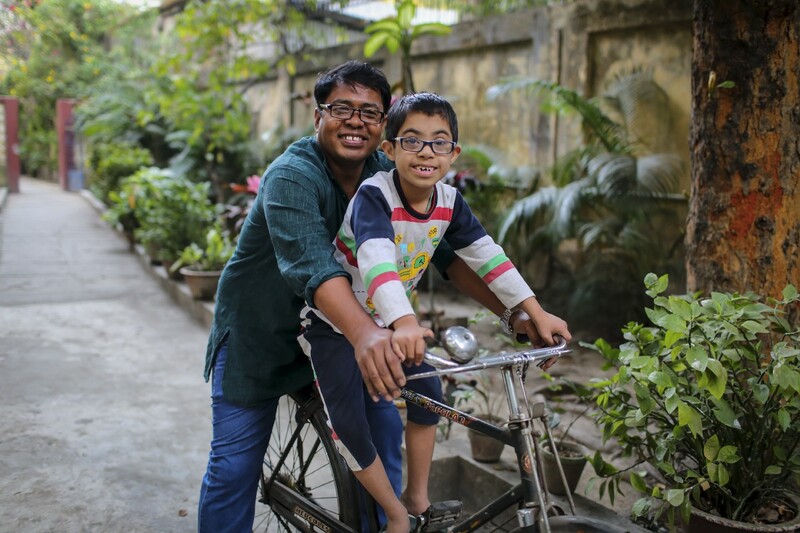 In recent years, L’Arche Kolkata has welcomed three children into the Community: Krishnendu, Riya and Kusum, and they have brought their own stories, along with their dancing, their chanting and their sense of good fun, breathing new life into the Community. When everybody has gone home for the day, Adi Bari settles and quietens. Madhu often reads the paper, sitting underneath a photograph of the Community taken some thirty years ago. Ganga, Muneshwar and Krishnendu gather in the hallway to watch the television, and Bulani, who is ageing and frail now, sleeps in a bedroom along the corridor. In the stillness I think about Rana’s statement: ‘Just as Kashi feels emotionally secure here, so do I.’ This is a community whose members know that they are loved and loved deeply. Riya and Sakanta. Photo credit: L’Arche / GMB Akash. Each evening, before dinner in both houses, the lights are switched off and the Community sits together in front of a batik that features the symbols of the world’s many religions. Over burning incense and Sanskrit chants, hands cupped over a lit flame, blessings are given to, and received by, each person. In Adi Bari Madhu, a Christian, lends his beautiful voice to the Sanskrit chant. Ganga calls out repeatedly to his god, his voice echoing around walls that have been prayed into over deep time. A faded photograph of Jean Vanier hangs on the wall, alongside the photographs of much loved core members who have died. There is not a night that passes when, from out of the darkness, the light from that burning flame is not offered up as a blessing to each of them, honoured for their story and life in L’Arche Kolkata. Ever a part of it. Amy Merone is a storyteller with L’Arche UK and is a part of the L’Arche Manchester Community. The photographs in this piece were taken by the photographer GMB Akash.